Robin Howell was born in Los Angeles into a family of artists, surrounded by art and music. His study of music began at a very early age under the tutelage of his elder brother, David, a singer, opera historian and composer. Robin began serious study of the recorder and clarinet at age seven, his first professional engagements at age eleven. Under the guidance of Dr. George Skapski at Cal State Northridge he began his research into early reed instruments, which continues today. Having fallen in love with the bassoon at twelve, Robin was fortunate to be taken under the wing of Don Christlieb, his long time teacher, mentor, colleague and friend. 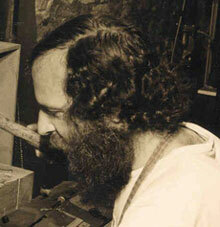 Robin had learned the basics of machining and silversmithing from his father and his uncle, and already had a keen interest in instrument making. Together he and Mr. Christlieb explored the bassoon and its music, both contemporary and Baroque, and the inner workings of both reed and bocal, theorizing and ultimately resulting, alas near the end of Don's life, in Robin's "CH" series bocals. Robin pursued study of psychology, philosophy, massage therapy, acupuncture and mycology. After a year living in Lima, Peru, where he played bassoon with the Orcestra Sinfonica Nacional. he spent four years at the Schola Cantorum Basiliensis, in Basel, Switzerland, with a dual major in Baroque bassoon and recorder. Robin performed and taught extensively, specializing in the bassoon literature and performance practices of the baroque and early classical periods. He has performed and recorded with many orchestras and chamber ensembles including das Basler Orkester Gesellschaft, Philharmonia Baroque Orchestra, The Smithsonian Institute Baroque Orchestra, The Apollo Ensemble, Amadeus Winds, Il Complesso Barocco, Tafelmusik, Ensemble Ricercare and Il Divertimento, to name but a few. Robin's very active performing career was cut short by Lyme Disease in the mid '90s, for which he is still in treatment. Even through this nearly fatal encounter, he has continued his bocal making and research, consultation on performance practice and fine instrument voicing, tuning and restoration as well as teaching. Robin currently lives in Toronto, Canada with his very talented daughter, Lyra.